Description: Come on over to the Enchanted Tiki Room to see over 300 audio animatronic birds, flowers, totem poles and drummers serenade and entertain for close to ten minutes. This show features songs such as “In the Tiki Tiki Tiki Room” and “Let’s all Sing Like the Birdies Sing”. A fun show for the whole group. Who: This fun theatre show is appropriate for everyone and has no restrictions. When: Rarely will you have a wait for this attraction so my advice is to save this for when you are waiting for a fastpass time to occur or you need to sit and recharge your batteries. 1. The original concept was for this show to be a restaurant, but it never came to fruition. 2. Your bird hosts are Fritz, Jose, Michael and Pierre. 3. The show contains thunder and lightning and an active volcano which may scare some younger audience members. 4. In January of 2011 a fire shut down this attraction which spurred its most recent update and return to its beginnings. 5. Check your times guide for opening times for this attraction. 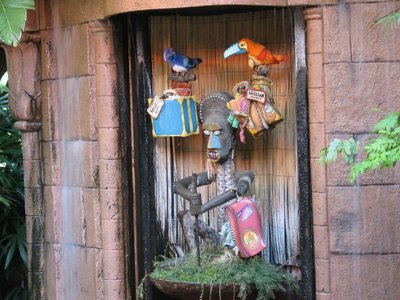 This entry was posted in Adventureland, Attraction Spotlight, Magic Kingdom, Uncategorized and tagged Adventureland, Enchanted Tiki Room, magic kingdom. Bookmark the permalink.